Many of you may be wondering how young healthy Kris Letang could suffer a stroke as was reported by the Penguins’ Organization today. Below is a primer to help you understand what, exactly, may have gone wrong. Your heart circulates blood differently when you are a fetus in your mother than it does when you are born and no longer have the benefit of a placenta. When in the womb a baby does not use it's own lungs to exchange gasses in the blood, it relies on the mother to provide oxygen rich blood from the placenta through the umbilical cord. The foramen ovale is a small hole located in the atrial septum that is used during fetal circulation to send more blood thru the body and less thru the lungs. Letang's hole in heart, generally closing by birth. Normally the foramen ovale closes at birth when increased blood pressure on the left side of the heart forces the opening to close. 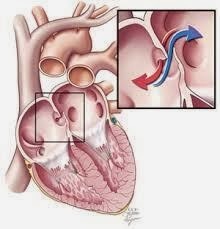 If the defect does not close properly, it is called a patent foramen ovale (PFO). This type of defect generally works like a flap valve, only opening during certain conditions when there is more pressure inside the chest. If the pressure is great enough, blood may travel from the right atrium to the left atrium. If there is a clot or particles in the blood traveling in the right side of the heart, it can travel out of the heart and to the brain (causing a stroke) or into a coronary artery (causing a heart attack). Depending on the size of the PFO, patients may have no symptoms. About 40 percent of patients who have a stroke have no known cause (called cryptogenic stroke). Migraine headaches are more common in patients with PFO and Kris Letang has suffered with those chronically. Patients who have had a stroke or transient ischemic attack (TIA) may be placed on some type of blood thinner medication, such as aspirin, plavix (clopidogrel), or coumadin (warfarin) to prevent recurrent stroke. So far, this is the treatment of choice for Letang. If, cardiologists decide to close the defect, it doesn’t mean open heart surgery is necessary. It may be done with an occluder during a procedure similar to a cardiac catheterization.